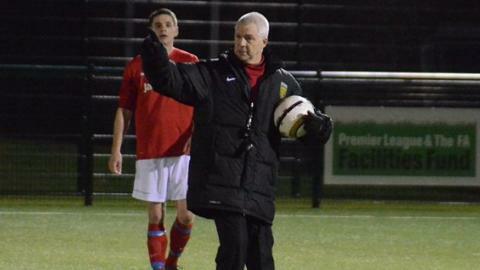 Jersey manager Brian Little's first match in charge of the island side will be against the Royal Navy. The former Aston Villa boss took over the island's representative side last month and supervised his first training session this week. The island's men's and women's sides will face their Navy counterparts at Springfield on 27 February. The matches are the first for Jersey as they prepare for their Muratti games with Guernsey in May. Jersey's women have already announced their squad for the fixture against their biggest rivals, with star player Jodie Botterill omitted. Wales international Botterill is ineligible as she has stopped playing after joining the coaching staff at local side St Peter. As well as captaining Jersey to gold at the Island Games, she also played for the island's basketball team at last summer's event. "She's had a tough summer playing two sports at the Island Games and she needs a bit of a break," said Jersey coach Charlie Petulla. "We've got a good relationship with Jodie and are always in contact with her. "She understands she's ineligible, but the door's still open and she's one of the best players to play in Jersey and we'd never shut the door on her. "But Jodie's not going to be around forever so we need to learn to play without her."